Just how sensitive is a dog’s sense of smell? Theoretically, it can detect a single spoon of sugar dissolved in a million gallons of water, the equivalent of two Olympic-sized pools, according to Alexandra Horowitz, author of the bestselling Inside a Dog: What Dogs See, Smell and Know. Now, trainers are channeling those talented snouts to help people with sensitivities to gluten, also known as celiac disease. Approximately 1 in 100 people have sensitivity to gluten, the protein in wheat, rye and barley. When eaten, gluten can spark an immune response in the small intestine, leading to abdominal cramping, bloating and diarrhea. The immune system can attack and destroy the lining of the small intestine, hampering the body’s ability to properly absorb nutrients, leading to weight loss. While there’s no cure for celiac disease, sticking to a strict gluten-free diet can help relieve symptoms and prevent complications. Even so, inadvertently swallowing as little as one-eighth of one teaspoon of gluten can damage the digestive tract of a person with celiac disease, according to the Celiac Disease Foundation. For people with celiac disease, avoiding gluten is easier said than done. There are obvious sources of gluten, such as breads, pastas, pizza crusts, crackers, cereals and croutons. But gluten can also be used as a filler or binder in lips balms, medications and supplements, salad dressings, toothpastes and flavored coffees. If a child with celiac disease simply handles Play-dough, often made with wheat flour, and then touches his or her mouth, it could cause a reaction. And gluten-free foods can become contaminated when exposed to cutting boards, toasters and even colanders that have touched gluten. 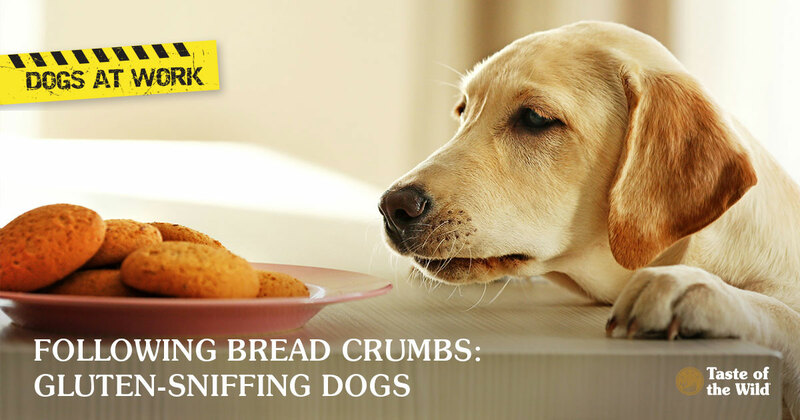 While gluten is almost odorless, some dogs can be trained to pick up the scent. In fact, a number of organizations across the country have training programs in place for gluten-detection dogs. As with other detection dogs, trainers look for dogs that are generally intelligent, motivated and have a drive to please their handler. While there are no national training guidelines for celiac service dogs (yet), most organizations introduce the scent to the dog and use treats and other positive reinforcement to reward the dog each time it identifies the scent. The dog is then taught to perform a signal, such as spinning in place, or raising a paw, each time it finds gluten. The dog detects the scent, rather than the physical reaction in the human, and alerts the handler of potential allergens in the vicinity. These scent-sitive service dogs may be trained to detect other potential allergens, such as peanuts, cashews, red dye 40, dairy or eggs. Of course, training can be extremely time consuming and can cost as much as $10,000 to $20,000 per dog. But for a person who could be sickened or go into anaphylactic shock when exposed to these items, a dog companion may be an effective tactic to help them stay healthy. Of course, celiac service dogs must be continually trained by their handlers to keep their snouts on point. And dogs, like humans, can’t always be 100 percent accurate. But it’s one more way that dogs are working to make life better for their human companions.